As soon as I knew the weather was going to be a little cooler, I was already planning to make butternut squash soup. It is my favorite soup EVER. I’ll always order it when I see it on a menu in a restaurant – which doesn’t happen very often! 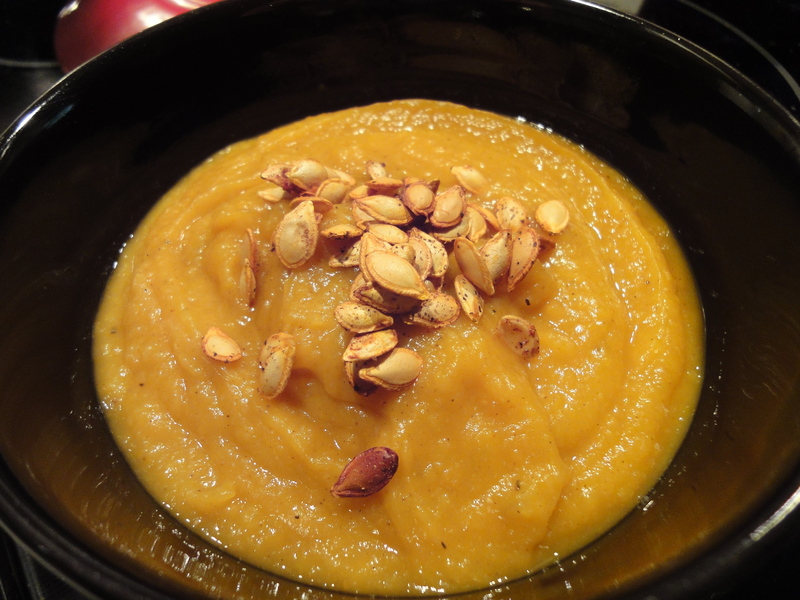 This soup can also be made with pumpkin. However, I learned when I went to the grocery store that the pumpkin crops were bad last year, so places are having a tough time getting pureed pumpkin. I was looking for some plain pumpkin to use for scones (check out my blog tomorrow for recipe!) and to put some in the soup. Instead, I snatched one of the last pre-made pumpkin mixes in a can that already has spices in it. This was all after hitting my 3rd store! I was getting disappointed at the possibility of not making the scones. 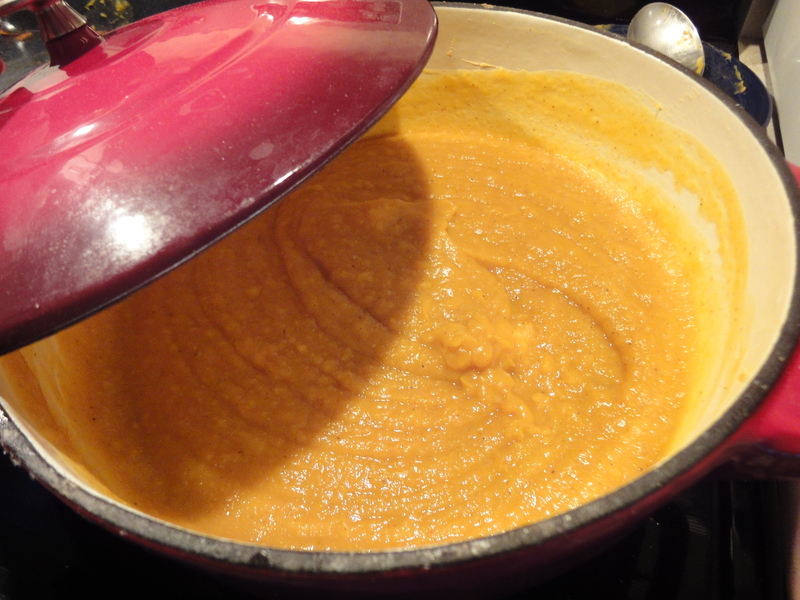 This time making the soup, I added a can of chickpeas for an extra bit of protein, and it made the soup SO thick! I had to add about 3 extra cups of water to thin it out, on top of the 2-3 cups of chicken stock I put in it. So here’s the recipe, play around with it until you find flavors you like. PS- these pics were taken on my boyfriend’s camera… it had a food setting! I love how well they came out, don’t you? Preheat oven to 375 degrees. Grab a roasting pan for the squash and a parchment lined baking sheet for seeds. To peel the squash, I find it’s easiest to cut the ends off, and cut the long “neck” of the squash into 2 pieces. Then peel with a knife or vegetable peeler. The seeds are in the bulb end of the squash, so scoop out with a spoon, and separate seeds from the stringy meat. Dice the squash into about 1” pieces. It’s not an exact science; so don’t worry if the pieces aren’t exact. Put the squash on the roasting pan along with your onion and garlic, drizzle with the olive oil and sprinkle with salt and pepper. Roast for about 30-45 minutes. Stir every 10 minutes. 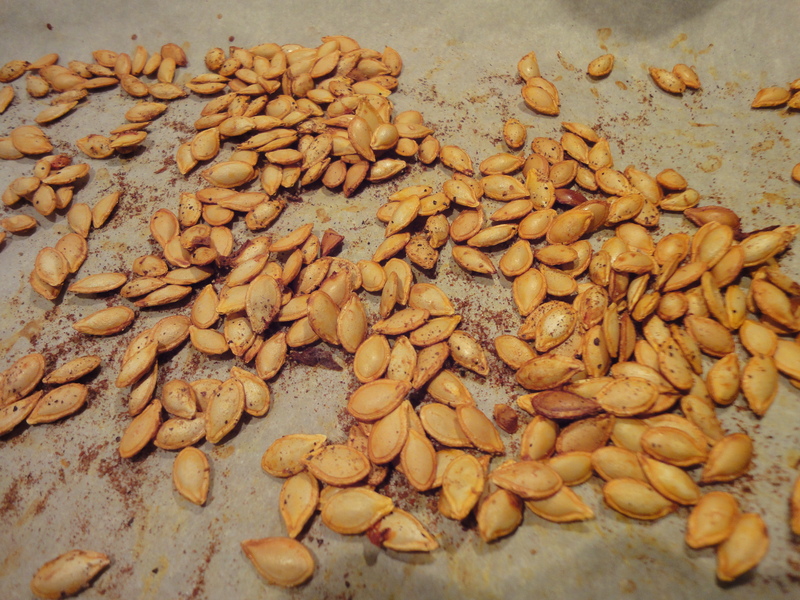 Place the seeds on the parchment lined baking sheet. Sprinkle with some pumpkin pie spice, chili powder and cumin. Roast until brown. Check on them after about 15 minutes. Then check every 2-3 minutes. Set aside. When you take the seeds out, dump your rinsed and drained chickpeas onto the sheet with the squash. Continue roasting until butternut squash gets soft and slightly brown around the edges. Now, time to puree! If you have an immersion blender, put all the roasting pan ingredients into your pot that you are going to cook the soup in, along with the 3 cups of chicken stock. Blend away! If not, use a blender and do in 3-4 batches and add chicken stock to each batch. Once everything is blended and in a big pot, add honey, pumpkin pie spice, chili powder, and cumin. Add water or chicken stock to desired consistency. Taste it! Does it need more salt? Pepper? Spices? Add them! Serve it up in a bowl or (my favorite) a mug. Top with roasted butternut squash seeds and enjoy! Last night I wanted a little salty snack, but as I am coming to the end of my last grocery stash, I had to improvise. I had a can of chickpeas in my pantry, along with some spices. 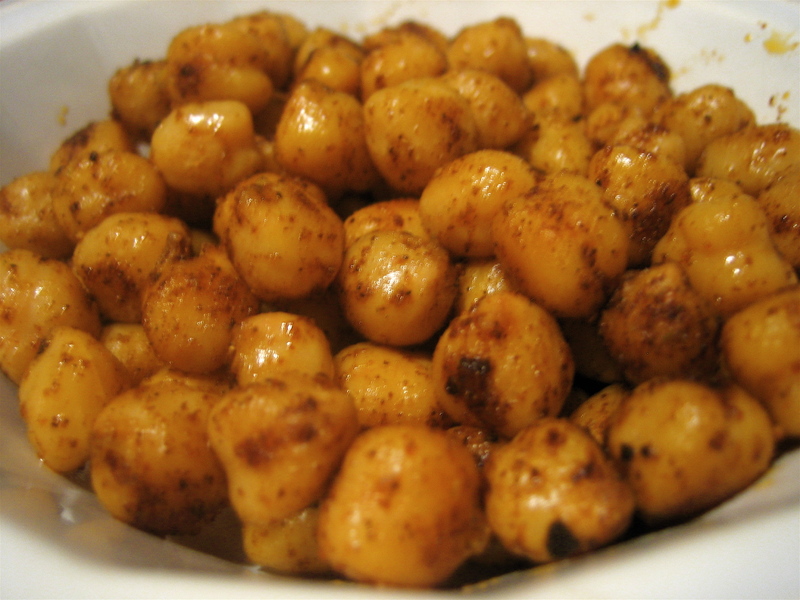 Now, I’ve heard of people roasting chickpeas to make a crunchy snack. BUT I cannot use my oven in my shoebox studio I call home. The fire alarm goes off every time! I have since given up trying. So, I decided to pan toast these little guys. While the results were delicious, they didn’t get as crunchy as their slow roasted counterparts. I think I was just being a little impatient (not one of my virtues by any stretch of the imagination). But they’re nutty flavors came out in a great way. I used chili powder, lemon juice, and cumin. Another great flavor combination would be a little bit of garlic, rosemary/thyme and lemon. The possibilities are endless. Like I said, you could also roast them. If you choose this route, put them in the oven at 400 degrees for about 30 minutes and shake the pan around every 5-10 minutes. Next time I have an oven available to me, definitely going to try that out! Heat up your pan on medium high heat along with the bit of olive oil. Throw in the chickpeas. Sprinkle in the spices and lemon juice and shake the pan around to stir. Since the pan is a bit high on heat, don’t walk away! Shake the pan around a bit… not constantly, but maybe every 30 seconds or so. We don’t want them to burn. Cook them for about 8 minutes or so. If they look like they’re getting too done, drop the heat a little to medium. I taste them along the way for seasonings, add more if needed. I like when they start popping in the pan a little. At this point, another 2 minutes and they’re done! Cool for a couple minutes, and devor! The great thing about this snack is that they’re high in fiber and protein. So eat up! Like my recipes? Subscribe to follow my blog for email updates of new posts!